Andrew Hrncar walks away from the plate after recording the last out for Westosha Central in Tuesday’s WIAA Division 1 sectional at Kenosha Tremper (Mike Ramczyk/The Report). A deafening, youthful crowd of mostly Kenosha Tremper students packed Alan Smith Field in a sitting-room-only atmosphere Tuesday afternoon. 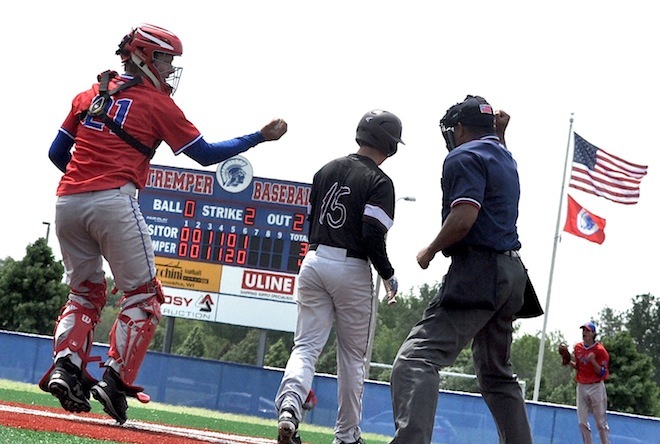 The Tremper baseball sectional featured the top-seeded Trojans and their 20-4 record against the young, upstart Westosha Central Falcons, a team that exceeded expectations with only two seniors along with achieving its first regional title since 2006. With the home faithful roaring and clutching the comfort of warm, wool blankets due to unseasonably cold temperatures in the 50s along with a blustery Lake Michigan wind, Central’s Andrew Hrncar represented the last hope with two outs in the top of the seventh and his team down one run. But much like the previous four batters, Hrncar had no answers for Reese Dutton, and what looked like a glorious comeback victory only 20 minutes earlier turned into the season’s final game as Tremper survived, 4-3, in a well-played, tightly-contested affair. It took Dutton only three pitches to strike out Hrncar, who took both hands and jackhammered his bat as hard as possible into the field turf in frustration as the Trojans jumped in celebration. Samy Greco smacked a two-out double down the left-field line to cut the lead to 4-3 in the sixth and chased Tremper starting pitcher Kyle Humphres, a senior left-hander that didn’t throw hard but was able to mix his speeds. Central was on to Humphres, though, and it forced the Trojans, with Falcons on second and third and the game in jeopardy of completely turning, to bring in Dutton, its ace and most dangerous arm. The flame-throwing right-hander was slated to start Tuesday night’s sectional final against the Burlington-Kenosha Bradford winner. Dutton didn’t disappoint, firing a nasty 12-to-6 curve ball to buckle the next Falcon batter before striking him out on two straight heaters. Westosha reliever Cooper Griffiths, who replaced starter Dylan Anderson the third time through Tremper’s order, was able to hold the Trojans at bay in the seventh. However, Dutton capped a virtuoso performance with a 1-2-3 seventh, overpowering Hrncar to end it. Dutton needed a mere 13 pitches to evaporate Central’s bats in 1-1/3 innings for the save. Perhaps Morman was referring to the fatal blow, a two-run double in the bottom of the fifth from Brandon Watkins. Greco went 2-for-3 with a double and two RBIs for the Falcons. Josh Leslie, a senior who will play at Mesa Community College in Arizona this fall, added two hits in his final game as a Falcon. For Morman, the future is bright with everyone back but Lefebve and Leslie.